One of the things we have enjoyed the most in Europe is the wide variety of landscapes and breathtaking views we have encountered during our journey. 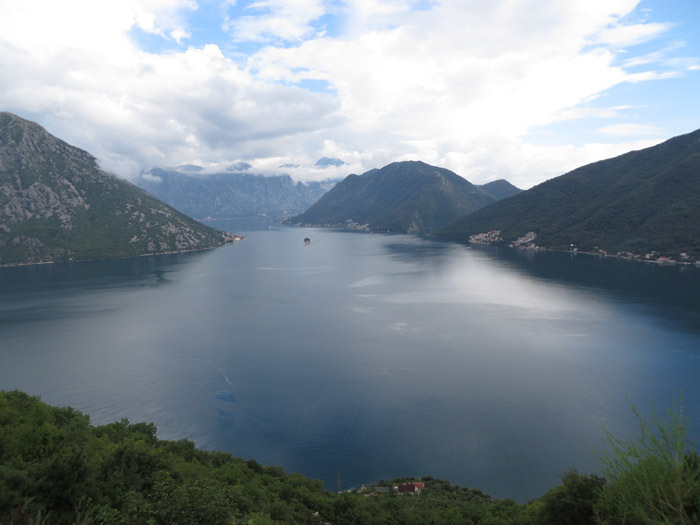 I had read about the beauty of Montenegro and figured we may as well include it in our trip. Boy were we not disappointed. This country was amazing. From Jaw dropping cliff lines to crystal clear water to the most beautiful bay in the world. It really was a feast for our eyes! On the morning of my 35th Birthday we decided to drive to Kotor from Sarajevo, entering from the north of the country rather than along the cost from Dubrovnik, which is the most popular tourist route. This drive took us along the most stunning winding road through the canyons of northern Montenegro. Apparently the Tara River Canyon is one of the steepest in Europe, and this road passes right near it. The region is a major rafting destination, and all along this road the views of the river were amazing. The Bosnian roads were terrible and quite dangerous, however they improved a lot as we crossed into Montenegro. Even though the roads were bad I think the drive took twice as long because we kept having to stop to take photos! After several hours of driving, we finally turned arrived at the Bay of Kotor. At first glimpse, the view of the bay through the break in the mountains is simply stunning! However as you continue to drive down the road along the side of the bay the view actually gets better as more of the bay becomes visible. A bear skin in the restaurant we stopped for lunch! Getting the hang of taking selfies! The Bay of Kotor resembles a Norweign fjord, with a handful of quaint old villages scattered along the shores of a set of intertwined inlets. The road continues winding along the shore and through waterside villages for about half and hour before finally reaching the town of Kotor. The Bay of Kotor driving down the hill pass road. We decided to stay in Kotor for four days so we could spend time exploring and get a good feel for the area. We stayed in a wonderful apartment Villa San Marco which was in a quiet location along the bay just north of Kotor Old Town. The apartment consisted of the entire top floor of a lovely traditional stone building, with two bedrooms and a huge space for our kids to spread their toys out and play. We had good internet and TV with DVDs which was a lovely little bonus. It was so nice to be in a homely environment for a few days and we all enjoyed the space. The apartment Villa San Marco is about 3km north of Kotor town centre. We usually drove into town, however it was also a nice experience to walk, and there is a flat pedestrian path along the edge of the bay that makes it a pleasant 40 minute stroll. There was also a family of kittens living outside, much to the delight of Milo! As it was my birthday Scott had prearranged a beautiful table at Restaurant Galion, which was rated the best restaurant in Kotor and nestled right on the harbour with a brilliant view of the bay. While this restaurant was more suited to a romantic night out, we managed to keep the kids entertained with fully charged electronic devices long enough to enjoy the meal, and the food was pretty good too! The other major reason for visiting the Bay of Kotor is to spend time in the UNESCO listed Kotor Old Town. The town of Kotor dates from 168 BC the Ventian period, but the old stone fortifications that surround the town were built in the Venetian period. Inside sprawls a maze of cobbled old lanes filled with restaurants and souvenir shops. The walls themselves can be walked along, and extend far up the side of the mountain! It wouldn’t be Europe without churches! Nearby the old town is a park with a playground and toy vehicles for hire. This was a good break for the kids, who did very well to walk with us all day and absorb the history without complaining! The boys love church candles! Perhaps the biggest highlight of Kotor is simply enjoying the many beautiful sunsets. Being surrounded by mountains gives a humbling sense of scale, and the serenity of the water in Kotor Bay leaves you feeling relaxed and invigorated. It is a great place to spend time as a family. Fathers day in Montenegro. My 3 beautiful boys playing together on a jetty in the Bay of Kotor.